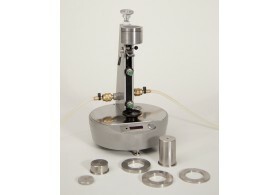 The Laray viscometer determines the viscosity and yield value of a wide range of viscous materials. In principle, it measures the relative velocity of two parallel surfaces, separated by a thin film of the measured visous material when a certain force (weigth of rod) is applied on one of the surfaces. The movement is hindered by the viscosity of the measured material and the travel time of the surface over a certain distance is measured.